OneSecondNeedle makes threading a needle as simple as 1-2-3. No more struggling to find the eye of your needle! Simply loop and thread and continue your work. Imagine all the time and frustration you’ll save yourself with the One Second Needle! Whether you’re a veteran at sewing or just starting out, you’ll find that it’s so much easier with the One Second Needle! Today, as part of this special limited time internet offer, you’ll get a complete set of 4 One-Second Needles - two large and two small - for the super low price of $10 plus $6.99 shipping and handling. 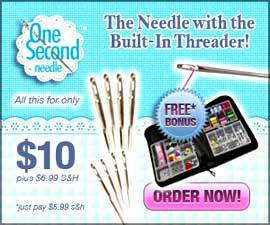 Act now, and as a bonus we’ll send you a second complete set of One Second Needle and the essential 130 piece sewing and mending kit, a combined bonus valued at $30 for no additional cost, just pay separate $5.99 processing fee. So you’ll get both bonus items, a combined $50 value for just $10.